It is shamal season on the Arabian Peninsula. 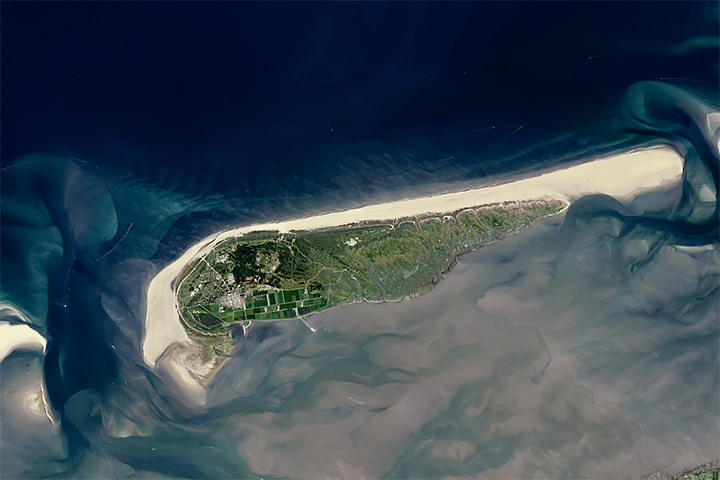 In the summer, a hot and dry, low-level northwesterly wind—the shamal—blows almost continuously, often stirring up huge clouds of sand and dust. 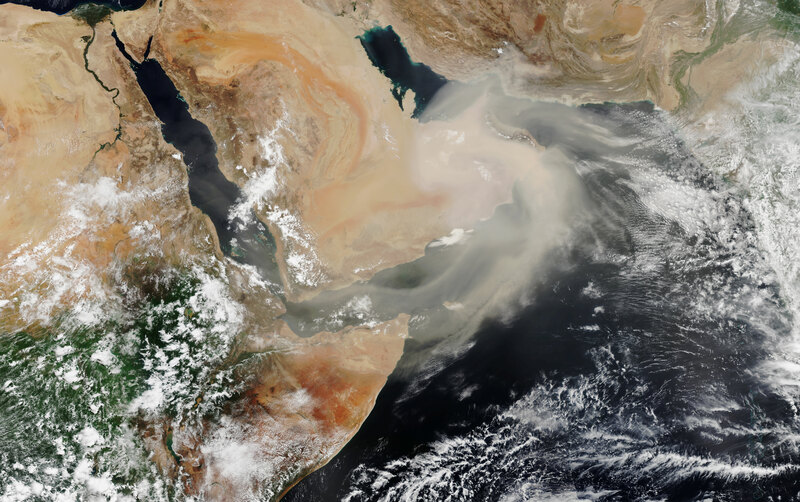 An expansive plume of dust from the Rub’ al Khali swept across the southeastern part of the Peninsula and over the Arabian Sea between July 28 and July 30, 2018. 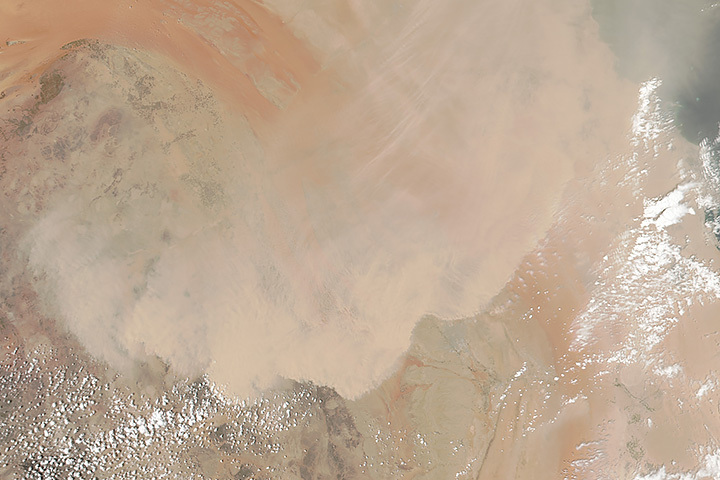 The Visible Infrared Imaging Radiometer Suite (VIIRS) on the Suomi NPP satellite acquired this sequence of natural-color images. Reduced visibility posed serious risks in the region. It caused hundreds of automobile and other accidents in Dubai, the largest city in the United Arab Emirates (UAE). Unusually high levels of particulates in the air also triggered warnings about allergies and respiratory health problems and led to increases in the number of people admitted to hospitals. Government health officials in several countries warned people to stay inside as much as possible and to cover their noses and mouths when walking outside. 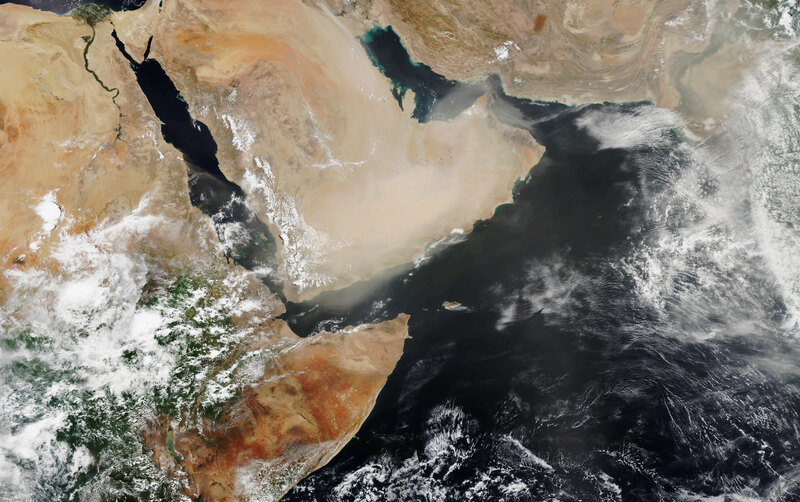 While people living on the Arabian Peninsula have long monitored the shamal and even oriented ancient cities to the northwest to maximize how much the winds ventilated buildings, modern-day scientists are still working to define and quantify it from a statistical perspective. One recent study reported that summer shamal winds usually begin on May 30, subside by August 16, and reach peak speeds each day around noon. 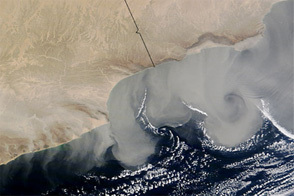 Wind speeds in excess of 11 meters per second (24 miles) per hour are required to lift enough dust to reduce visibility below 3.5 kilometers (2 miles), the typical threshold for a dust storm. 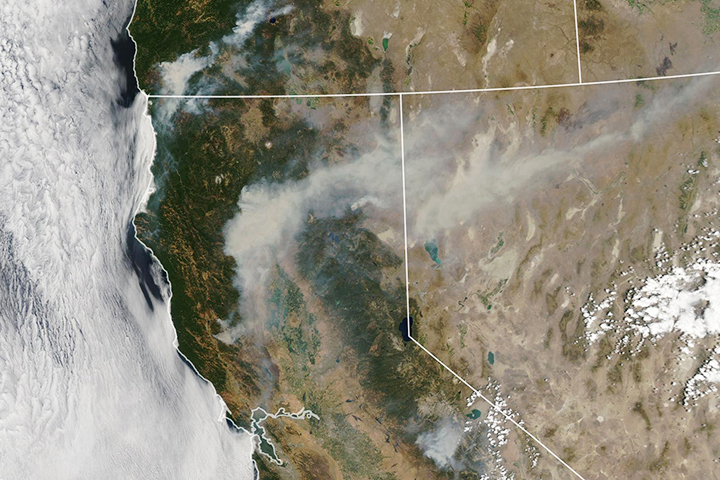 The research team used long-term ground-based weather observations and satellite aerosol and plume data, supplemented by information from NASA’s Modern-Era Retrospective Analysis for Research and Applications reanalysis to reach their conclusions. Arab News (2018, July 27) Heavy sandstorm sweeps Riyadh enveloping city skyline with dust. Accessed July 31, 2018. Khaleej Times (2018, July 31) Dust storm leads to 20 percent rise in allergy patients in UAE. Accessed July 31, 2018. Neumann, J. (1977) The Winds in the World of the Ancient Mesopotamian Civilizations. Bulletin of the American Meteorological Society 58 (10), 1050-1055. The National (2018, July 31) UAE dust storms likely to last for days. Accessed July 31, 2018. 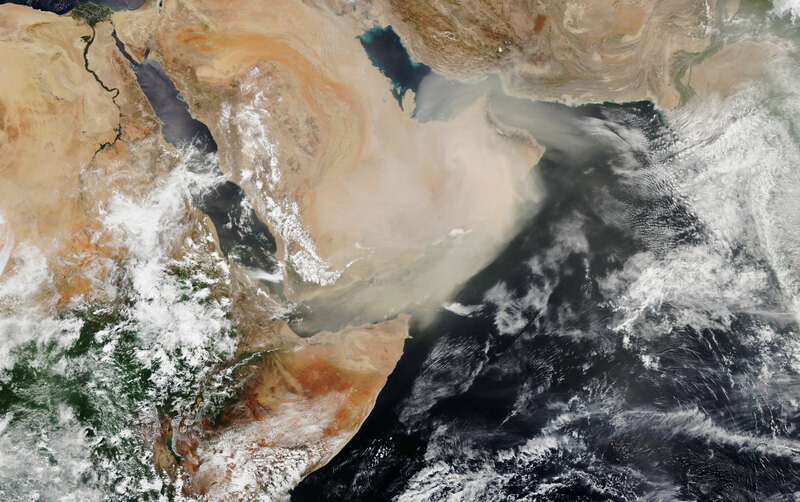 The Times of Oman (2018, July 31) Dusty conditions to clear up in 3 days: Oman's met office. Accessed July 31, 2018. Yu, Y. (2015) Climatology of summer Shamal wind in the Middle East. Journal of Geophysical Research: Atmospheres, 121 (1). 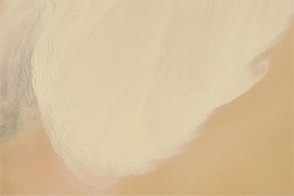 NASA Earth Observatory images by Lauren Dauphin, using VIIRS data from the Suomi National Polar-orbiting Partnership. Story by Adam Voiland.